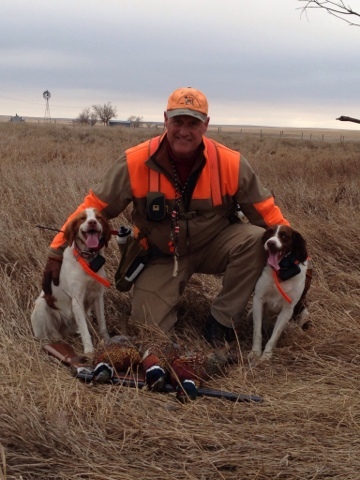 A Bird Hunter's Thoughts: One of those great days...you don't get many! Cap and Ruby have one pinned down! My two pups after a GREAT day!! This rooster was huge! Cap is loving this! It was windy and cold and I wasn't real excited when we approached the tree line. Over the years, I've walked this tree line probably 30 times or more. It is situated perfectly with corn on one side and CRP on the other. Big tall trees seen for miles in the wheat and cut corn in North Dakota. A friend owns the farm, now retired, and told me, "Randy, there are lots of birds here. Come on over!" I learned subsequent to that, there were people hunting there the day before. "Oh, great! ", I thought, " They moved all the birds out of there. Another 4 mile walk with the dogs..."
The wind was strong from the North, right down the center of the tree line. Huge, old Cottonwoods and evergreens, maybe 4 rows of them. We put Ace, my main gun, out with Ruby with the intentions of easing over to the end of the row and working straight up it. This wasn't Ace's first time here. 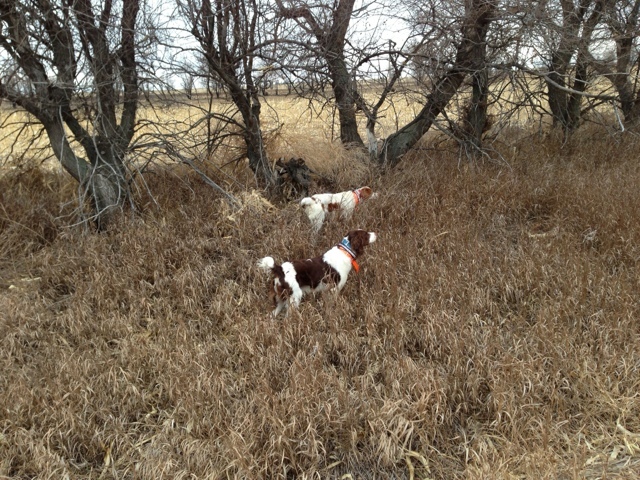 Once the "first put out rodeo" was over, I checked my Astro and Ace was pointed....in the treeline! We hustled to him, entered the shade of the trees, saw him locked up and stepped toward him. The rooster broke up and out, but Bobby's 20 ga. with Prairie Storm 3"/5's put him dead in the air, just as he cleared the alder row on the edge of the trees. It was a beauty! Ruby locked up, Ace backed (dutifully, but grudgingly) and 3 roosters took took off. I killed a tree and Bobby, again, dropped a bird for a retrieve. We worked our way to the end of the treeline, with birds coming out the sides, too far ahead to shoot. The dogs were not perfectly disciplined, but close enough I was pleased. Heck, there were so many roosters running around, I wasn't all that disciplined, either! At the end of the row, Ace locked down and Ruby backed. The birds went out away from me, right into the gun of Bobby. I think he was a little surprised, but he let it get out a suitable distance and dropped it out in the cut corn. Ace put it in my hand with a tip of the hat to the shooter- praise not easily earned from the experienced gun dog. After lunch, we put Cap, my 2 year old by Ace, down and Ruby, again. We worked some smaller tree windbreaks with corn in between. Very little cover and I was not hopeful. Right out of the box, both dogs got birdy and slowed down, hunkered down, cat-creeped to some blown brush at the edge of the cut corn. For a hundred yards, we pointed, released, pointed, released, backing, etc. One after another, the pups took turns pointing and backing. Finally, after a hundred yards of this, 4 roosters and 2 hens busted out for freedom. I was the only one near and it was clear shooting in a target-rich environment. And not one bird went down! The sun got in my eyes, my alarm clock didn't go off, a dog ate my homework! I need more excuses! I just missed. Period. Both dogs looked at me....it was bad. Cap picked up the scent and worked some CRP. Finally, he locked up and I kicked a big rooster out from a brush pile and put him in the bag. 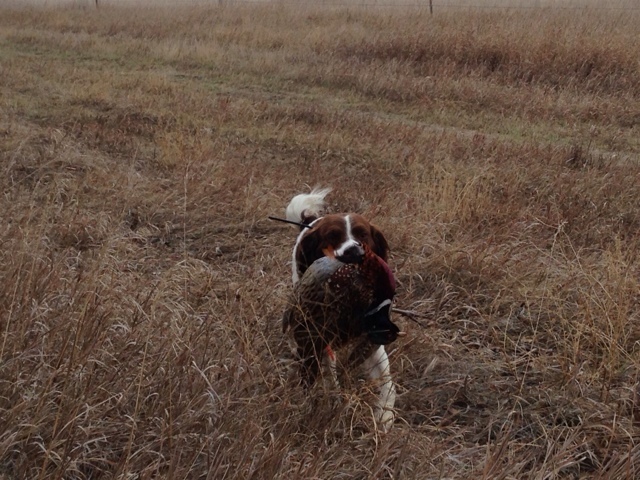 Another treeline bird bit the dust, further up, after Ruby's fine work; and we headed for the truck, one bird short. I looked to my left and we walked and talked; Ruby was locked down in the grass along the trees! As I approached her, a rooster jumped up, tried to fly, couldn't get airborne, and ran! Ruby went after it, Cap joined the chase, I yelled, "Dead bird, fetch it up!" and the merry chase was on. At one point, Ruby got a mouthful of feathers, but the bird got away. We worked up and down the trees, until Cap locked up and I walked over, saw the bird hunkered down, picked it up and dispatched it. I don't know why it didn't fly, but it still put up a good fight. I still get chills thinking about yesterday. Good companionship, good dogs, smart roosters. Sweet.